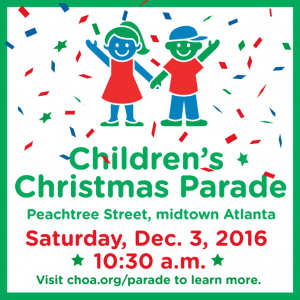 Grab the kids for an Atlanta tradition at the Children’s Christmas Parade. Beginning at 10:30 a.m. on Saturday, Dec. 3 the Children’s Christmas Parade will step off at Peachtree St. and 16th St. and end at Peachtree St. and 5th St. Watch as Midtown Atlanta will be transformed into Santa Claus Lane with the sights and sounds of the season. With floats, giant helium-filled balloons and marching bands, the Children’s Christmas Parade will be the largest holiday parade in the southeast. Thousands of spectators will be lined up along the streets eagerly awaiting the arrival of Santa and the official beginning of the holiday season in Atlanta. Can’t make it to Peachtree Street? Please tune in to WSB-TV Channel 2 to view the Children’s Christmas Parade live. Breakfast with Santa takes place at the Four Seasons Atlanta Hotel at 8:30 a.m. on parade morning. Guests are served a buffet breakfast, enjoy special Christmas crafts and a visit from Santa & Mrs. Claus before they board their sleigh to ride down Peachtree Street. Breakfast with Santa guests will also receive bleacher tickets with their purchase. Bleacher tickets for the Breakfast with Santa event are located on Peachtree Street in the WSB TV zone between 11th and 12th Streets.